You may already have heard roughly half a million renditions of Let It Go, but we promise it’s worth hearing one more time just so you can see this stunning Christmas lights display. 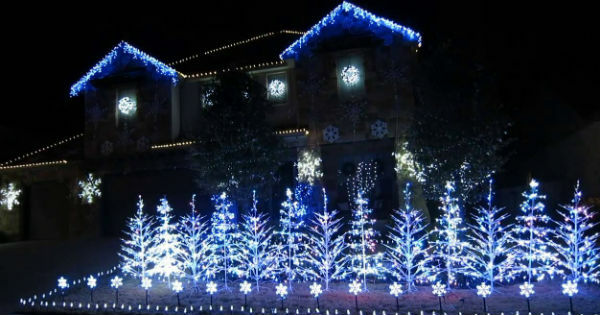 A family in Austin, Texas, has created a lights spectacular synchronised to the hit Frozen song, as well as Do You Want to Build a Snowman?, as part of its one-hour Christmas display. And it’s amazing. Homeowner John Storms tells the Huffington Post he and his wife have put together lights shows for the past four years to celebrate the festive season. “I’ll be doing this forever. I make it a happy family event so that the kids will keep it up,” Mr Storms says. Setting them up is no picnic – they started work on this year’s show back in February. There are tens of thousands of LED lights but Mr Storms says it’s energy efficient, with a power bill of only about US$6 each season. And he says all the effort is worth it. “When we do the lights to music we have the neighbours, family, friends come out with their camp chairs and we all sit in the street and watch the show. It’s a great little neighbourhood activity,” he says.